An acrylic knit beanie with dotty pattern and bobble (well, there's a bobble on the hat for years 7-10 and 11-13 but the Health & Safety man has decided that you can't have a bobble on size 2-6 'for child safety reasons'. I kid you not!). 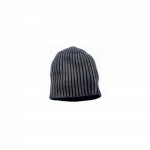 Dare2b Tumble Girl's Beanie Hat.